Alberto here doing this week’s fill ins. If you’d like to join the blog hop, head on over to McGuffy’s Reader or, to our friends who co-host the hop, 15andmeowing. You can also add your “Seussian” fill ins in the comments in this blog post. “Today you are you, that is truer than true. There is no one alive who is you-er than you! 1. My favorite Dr. Seuss book is _________________. 2. The most interesting person I have ever met is ______________. 3. Besides books by Dr. Seuss, my favourite book as a child was . 4. Lately, I have been working on . 2.The most interesting person I’ve ever met is purrhaps the relative of my humans who has been staying with us. This human enjoys doing puzzles and I enjoy helping challenge him by knocking those little pieces on the floor or, in some cases snacking on them. This human foolishly attempts to protect his puzzles with cardboard (to no avail I might add). My humans have never introduced me to this wonderful feline activity. 3.Besides books by Dr. Seuss, my favorite book as a child was not really a book at all. You see I was a 21st Century kitten and I spent less time reading and more time playing games on the iPad. I would like to report that as an almost adult cat, I have become more litter-ary. 4.Lately, I have been working on getting The Female Human in gear to update our website (FelineOpines.com) . She added a nice section about Cat Cafes from Katzenworld and also linked to a website that lists cat cafes all over the world. Nice job Human. This entry was posted in adopting kittens, cat behavior, Cat blogs, cat cafes, cats, kittens, Siamese cats, Top 50 Cat Bloggers and tagged Alberto, Alberto Contador, cat cafes, cats and puzzles, Dr. Seuss, Feline Opines, Katzenworld, The Cat in the Hat by Feline Opines. Bookmark the permalink. The protection of the puzzle pieces is the best part. I laughed out loud. 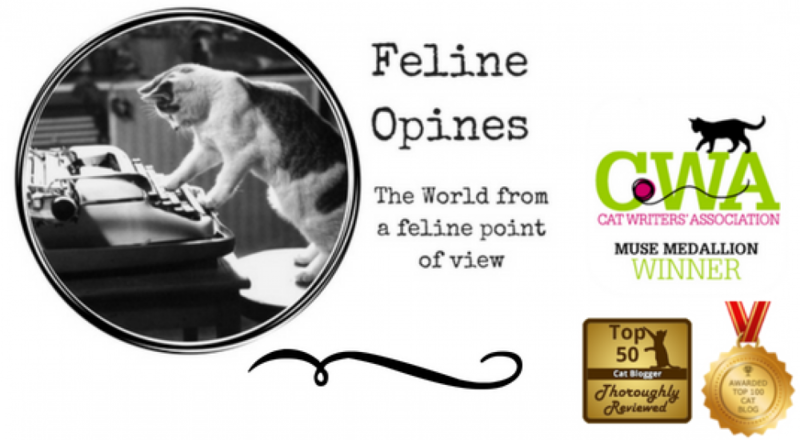 We strive to get some LOL’s at Feline Opines. You should have been there when I barfed up a puzzle piece and The Human’s relative asked, “Was it a blue one?” Never a dull moment. happee seuss day two day guyz….R fave o rite book iz one fish two fish…go figure huh !! ☺☺♥♥ ya look awesum in yur hat dood !!! Why thanks, I kinda’ like the hat myself. Thanks for the kind words! The Cat Cafe info is on our website at FelineOpines.com (you can even read Oliver’s concession speech there when he didn’t win his bid for Purresident)O. Why thank you! It’s nice to have a human appreciate my work! A cat who likes to do jigsaw puzzles! Welcome at my house any time! And so cute – I could never get mad if the odd piece went missing! Why thank you, I think my “rearranging” the puzzle was less of an issue for the human puzzle person than my eating the pieces and barfing them up. What can I say, I’m a cat and a curious one at that! Your images and words all made me smile. I loved this. Thank you for being so great. Hugs! Why thank you! Your comments made us all smile at The Tribe of Five. Yes, puzzle education is important for the humans. The Tribe of Five have decided that since there are now options for ordering from Amazon that do not require opposable thuumbs. we are working on getting our meows to sound like, “Alexa, order puzzle”. It’s a long shot but worth a try!